In USA Rugby’s South Region, Saturday’s less active lineup reflected how the 2019 Spring Season winds down as the clubs prepare for the playoffs. Both of the women’s games Saturday were played in the Sunshine State. In a stunning upset, the Tampa Bay Krewe rallied from a 7 to 5 halftime deficit to defeat Fort Miami’s RFC 19 to 14. 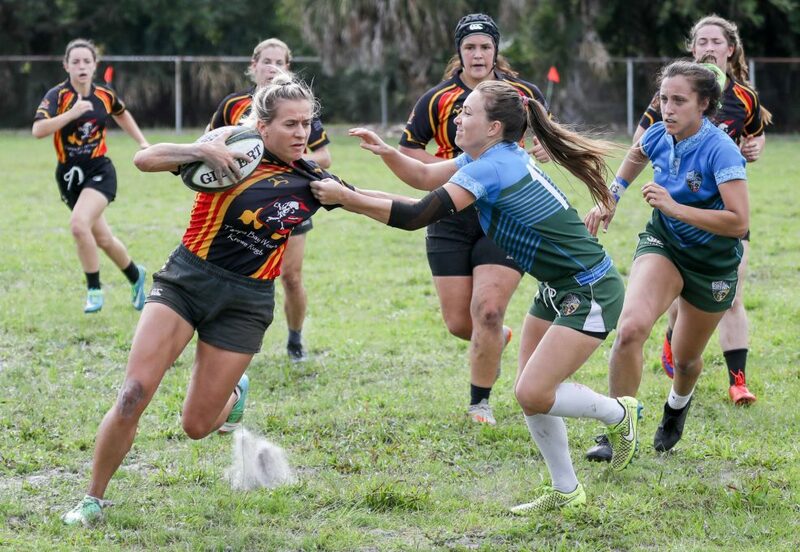 In the first half, Lindsey Koren scored one try for Fort Miami, and Elisabeth Gallant’s try put points on the board for the Krewe, but the conversion was no good. In the second half, Lindsey Koren scored another converted try to briefly build Fort Miami’s lead to 14 to 5. However, Samantha Black and Vicky Becerra reached the try zone for the Krewe. With two successful conversions kicked by Robyn Becerra, Tampa Bay took a five-point lead Fort Miami failed to erase. Also, in Florida Saturday, the Orlando Griffins blasted by the Indian River Raptors 96 to 8. Jessica Warner led Orlando’s scoring with three tries – at the 38-minute, 60-minute, and 70-minute marks. Heather MacNeil and Shontavia House also reached the try zone multiple times. Charlotte Rugby rolled all over Tobacco Road, winning the matchup 57 to 12. Matthew Aronowitz and Kevin Koch each secured multiple tries for Charlotte. Joseph Sherlock and Bryce Jahner scored Tobacco Road’s two tries, both of which were earned after halftime. Elsewhere in the region, the Charleston Outlaws outlasted the Greenville Griffins 31 to 25 . Michael Abt, Joshua Cabrera, Alexander Wohlers, and Benjamin Sinwell all scored one try for the Griffins. Toward the tail end of the Florida Peninsula, Miami Rugby mauled the Fort Lauderdale Knights in a 64 to 19 decision. Miami only led Fort Lauderdale by five at halftime, but the Knights only scored one more unconverted try in the second half. Miguel Lindsey and William Moreno led the Miami, and both clubs, with two tries a piece. Chattanooga Rugby pounded the Knoxville Possums 81 to 7 Saturday. Chattanooga’s Samuel Koebley, Austin Morris, and James Jones led the team with two tries each. Nashville Rugby blanked the Memphis Blues in a 74 to 0 blowout. Andrew Rappe led Nashville with three tries. Michael Backens also scored multiple tries (two) for Nashville. Even thought the Raleigh Vipers held a sizeable 9-point at halftime, the Triad Rugby would ultimately win the game 31 to 26. Taylor Young scored two tries for Raleigh, with Jordan Robertson and Andrew Agans reaching the try zone once. The Asheville Iguanas continued pounding all of their competition, blowing out the Charlotte Barbarians 60 to 0. Brent Morgan led Asheville with three tries, and Kenneth Wayne reached the try zone twice. Wrapping up the region, the Gwinnett Lions defeated the Atlanta Old White D3 side 27 to 19. Tehran Carroll scored two tries for Atlanta, with David Winiarckyz earning the team’s remaining try. In a game where all of the tries were scored after halftime, the Palm Beach Panthers beat Brevard’s Old Red Eye RFC 28 to 8. Lukem Beaumont (two) and Jonathan Morgan each earned tries for Palm Beach. Jordan Whiting scored Brevard’s one try. Up in Tampa, the Sarasota Surge rallied from a 13 to 3 halftime deficit to defeat the Tampa Bay Krewe 28 to 23. Finishing off Florida, the Gainesville Hogs beat the Saint Petersburg Pelicans 32 to 18, handing Saint Petersburg its first loss of the season. The Pelicans held a slim 13 lead at halftime, but the Hogs outscored them in the second half 22 to 5. Ending this weekend’s Southern Division action in the True South, Huntsville Rugby defeated the Gadsden Pioneers 33 to 6 in the True South’s only Division III game.